Ironworkers at Niacet Chemical Company, Niagara Falls, New York, 1928; Cliff Keene second from left. 1929 union card, International Association of Bridge, Ornamental, and Structural Ironworkers. Images courtesy Steve Gilford, from the personal collection of Clifford Keene. Clifford Keene, MD, then-president and CEO of Kaiser Permanente, at the West L.A. Medical Center dedication in 1974. Dr. Keene had been an Ironworker and member of the International Assn. of Bridge, Ornamental, and Structural Ironworkers, Local 6. During World War II, Lt. Col. Keene directed several medical facilities in the South Pacific and in the United States, and at the end of the war, KP founding physician Sidney R. Garfield hired him. In 1954, he became the first president and CEO of the Kaiser Foundation Hospitals and Health Plan. 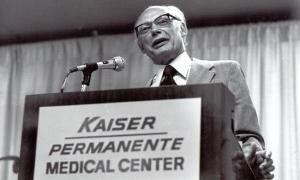 Keene continued to serve Kaiser Permanente for many years, and is remembered for his work defining and implementing the delivery and payment for health care that became known as the “Kaiser experience.” He retired in 1975. On January 25, 2000, he succumbed to Parkinson's disease. *The terminology of the two trades is often confused, and even Dr. Keene succumbs to this drift: Strictly speaking, steelworkers make steel, ironworkers build with steel.